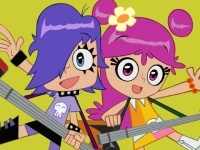 The Cartoon Network's newest original animated series, Hi Hi Puffy AmiYumi, is based on the real life Japanese pop band Puffy, which features lead vocalists Ami and Yumi. Ami is the peppy, positive and resourceful one, while Yumi is the hard-rocking cynic with an infallible sense of cool. In its cartoon incarnation the band travels around in its fully furnished customized Puffy bus and despite occasional misjudgments by the band's tragically square manager Kaz, the girls survive exotic adventures such as being chased to the center of the earth by obsessive fans, jamming with aliens and getting knocked into a video game by a tsunami. The cartoon series will also feature live action segments starring the real life band performing the group's catchy J-Pop hits. The influence of anime on 'American' series on the Cartoon Network such as Teen Titans and Megas XLR is quite obvious, but Hi Hi Puffy AmiYumi with its bouncy J-Pop ditties represents a window on another aspect of Japanese popular culture -- one that anime fans are familiar with thanks to the songs used in anime series as well as the 'pop idol' anime, a genre to which the new Cartoon Network series certainly seems to belong. Will J-Pop culture be the next big thing? Tune in on Friday Nov. 19 at 7:30 pm (ET, PT) when Hi Hi Puffy AmiYumi debuts. In advance of the series debut the actual band Puffy is scheduled to perform 3 select concerts featuring top songs from their nine-year career. On October 8 they will be at Webster Hall in New York City, followed by shows on October 10 in Los Angeles (House of Blues) and October 11 in San Francisco (The Filmore). Puffy also did the theme song for the Teen Titans cartoon (see 'Cartoon Network Adds J-Pop Series').